Invisalign braces are a very discreet teeth-straightening method that makes use of almost invisible custom-made aligners. Our dentists will help you get that straighter brighter smile with the use of Invisalign aligners. On the first visit we will talk you through all the options that are available to you that will solve your individual dental problem and achieve the result you want. The next step is to take bite impressions of your teeth. These are then sent to the laboratory so that your bespoke Invisalign braces can be made. In the laboratory, Invisalign uses cutting edge 3-D computer imaging technology to make your clear, removable and bespoke aligners. In fact, to complete the correction process there can be anything from 12 to48 aligners in the series that you will need to wear. The next time that you visit Wimpole Dental Office in London it will be to have the first set of braces fitted. This will be the beginning of the process and at this time you will probably be given a few additional sets to wear before your next visit. Each set of braces is worn for about two weeks before it is time to move on to the next. The braces can be removed but should be worn most of the time and only taken out for eating and drinking, for brushing and flossing. We will check on your progress every six weeks. The total treatment time will be on average between 9 to a maximum of 15 months. The treatment ends once each one of the series of braces has been worn. You will need to wear retainers at night for six months, and then quite possibly a few times a week to ensure that the teeth do not move back. Why should I choose Invisalign braces for my tooth straightening? Invisalign braces are virtually invisible and made of a clear material and because of that no one will notice that you are having tooth-straightening treatment. Invisalign braces are convenient because you can remove them removable to eat,drink,floss and brush and they can even be left out for special occasions. The Invisalign system is comfortable to wear withno metal brackets or wires to irritate the inside of your mouth or rub against your gums. Even before the full Invisalign course is over you will start to enjoy the benefits of the straighter, better smile as your new alignment begins to appear, right from the outset. 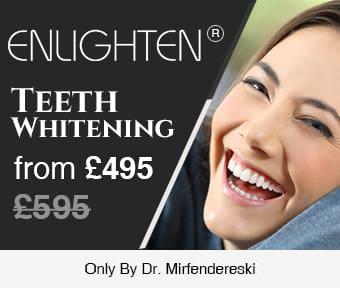 How much will Invisalign treatment in London cost? As a rough guide, Invisalign treatment will be most commonly be between £2500 and £4500 with the final cost dependant on the extent of the treatment required. We will be able to advise you, before the treatment starts. If you would like to see an Invisalign specialist in Wimpole Dental Office on Wimpole street, London contact us for a no obligation appointment.